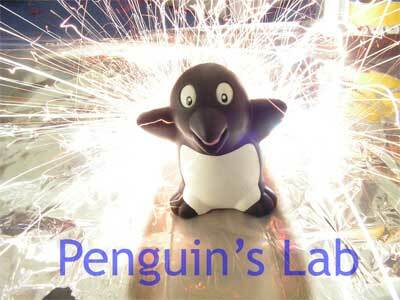 Penguin's Lab - High voltage,high energy and high temperatures. Welcome to Paul Peng [aka Penguin]'s world. Capture colour at the click of a button. A novel optical tool to help you design and renovate. Ignition coils- The cheap man's source of high voltage fun. Tesla coils are arguably the most famous high voltage generation devices. High energy discharge experiments mean lots of noise, sparks, and awesome photos! The coilgun was developed mid 2005, and its projectiles reached speeds of over 100km/h. 3D images that are so lifelike that they can be mistaken to be real... a showcase of Penguin's holograms. Experiments concerning semiconductor lasers, and also the "Darwin laser lightshow"! Freezing action as it happens. Introducing the Penguin's Lab high speed sound-activated flash unit, and high speed photography achievable with nothing special. Accelerating action as it happens. An automated camera system for seeing grass grow and flowers wilt. Framing action as it happens. A simple strobe and camera setup which breaks the action down into 'Charlie Chaplin' frames. The ability to see right through dark glasses and turn summer into winter. Explore the world through infrared light! Fibre optics technology...the telephone line? Nah, fibre optic cameras and lamps are better! Low voltage fluorescent tube drivers are the dream of campers and hikers everywhere. Explore the world of new age lighting from sodium vapour 'streetlight' bulbs to the humble but revolutionary LED. Shattering glass with mere sound? Explore the world of resonance. Melting scrap aluminium into something a tad more useful... and a lot of firey heat in the process! A trebuchet with microwave oven transformers as a counterweight! Launched early 2006, this camera carrying balloon floated above Darwin. Peltier devices are the portable, semiconductor solution to refrigeration. The Flood Triggered Automated Camera System (FTACS) is designed to capture imagery of intense flash flooding. Kits, components, and everything else that matters! All about Penguin's Lab! Who, what, where? Want to share your advert on Penguin's Lab? Disclaimer: Most of the projects listed on Penguin's Lab do not carry a schematic - for good reason! Treat all advice with caution, and use your common sense!